The world's second largest mobile PC vendor, Acer, expects IT hardware prices in India to go up by about 5% by the end of the year on the back of rupee depreciation and shortage of hardware. Increased demand for notebooks and desktops will create this shortage. The firm has been witnessing an increase in pent up demand from big companies as well as SMB enterprises in the country. 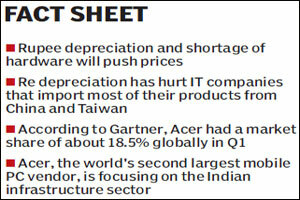 S Rajendran, chief marketing officer at Acer India, said: During the recession in 2009, there was a shrink in demand. This was because the industry did not create the capacity. However, companies are now opening up, and the back-to-school time frame is pushing the demand. But with the shortage of IT hardware, we expect an increase in prices. Pricing will be a major concern as over the last quarter, rupee has depreciated by about 4.5% to touch Rs 47. This has hurt the IT hardware industry that imports most of its products from China and Taiwan. Acer, which has manufacturing units in China, Taiwan and the Philippines, says besides the currency fluctuation, the growing labour concern in the Chinese markets could further add to the costs. The labour costs in China have gone up recently as there is a shortage of labour. However, China remains a preferred location for manufacturing IT hardware. Last year, the government reduced the import duty to 8% from 10% in a bid to provide stimulus to the industry. This sop was, however, withdrawn in last Budget. Manufacturers also pay customs duty of 10% after an abatement of 20% on the MRP (maximum retail price). The industry has made numerous representations to the finance ministry in a bid to increase the abatement to about 30-35%. This is another factor that has increased the overall expenses of manufacturers. infrastructure as well, Rajendran added. Acer, which currently has a market share of about 30-35% in the e-governance and Sarva Shiksha Abhiyan projects, said it is betting big on the government sector in India.